An update from the field! In the last quarter of 2016, Vision-Aid took up a number of activities in India. Computer training courses for the visually impaired were undertaken and surveys were conducted for eye-screening requirements in schools. Vision Aid runs different levels of computer training courses, focusing on the use of accessibility tools, for Visually Impaired. The advanced courses target Administrators and Teachers (ACA). There are beginner, certificate and diploma courses for individuals who need to use computers in their daily lives (BCA, CCA, DCA). The more advanced employment oriented advanced course (ECA) helps orient adults towards employment. The courses are run at various Vision Aid centers. Are schools voluntarily conducting eye-screening camps at school? If yes, what is the frequency? When was the last camp held? Does it include all students or only those with identified problems? What is the outcome of the testing? What remedial measures are taken post-testing? The inputs obtained from these surveys will be used to plan targeted activities - conduct regular camps, sponsor spectacles, improve coverage across schools etc. The CADRE team conducted a seminar for the women members to improve awareness about the computer training courses conducted by Vision Aid team. The Vizag team reported that COHOOT (Co-operative Hostel for Out Of Towners) is working well and has been effective in retaining out-station students. In the coming quarters, the team is planning to regulate the use of the hostels and also improve the amenities provided. The team also conducted ACA training at LB Engineering College for Women for the 44 final year students. A valedictory function was conducted at the college in the second week of December. Another good news shared by the team was about their entry, Haptic Torch for the Blind, getting selected as a finalist in the NASSCOM Social Innovations Forum contest. Many congratulations to the team on this fabulous achievement! The Vizag center celebrated World Sight Day 2016 on Oct 13th at Vision Aid Centre. They have also kickstarted their online Python programming course. All the centers are working towards planning and executing current, as well as new programs! Thank you for yout interest and support! April 17th, 2019 was great day for Vision-Aid volunteers and partners in the greater Boston area. Vision-Aid along with partner Orbit Research participated in the Accessible Technology Day at the MIT museum. This event was part of the Cambridge Science Festival. The theme was "Accessible Technology: New Ways to Interface with the World". On January 12, 2019 Vision-Aid and Aravind Eye Hospital, in Madurai, formally launched the Vision-Aid National Resource Center (NRC) for the visually impaired at Aravind Eye Hospital, Madurai, the world’s largest eye care system. Over 2500 patients are served daily at Aravind Eye hospital's main branch. The Inclusive STEM Hackathon is a 24-hour hackathon where visually impaired coders and software developers, industry professionals, and engineering students come together to work on exciting and challenging projects. This years Inclusive STEM Hackathon began on 17th January and ended on 19th January, on the campus of IIIT Bangalore. 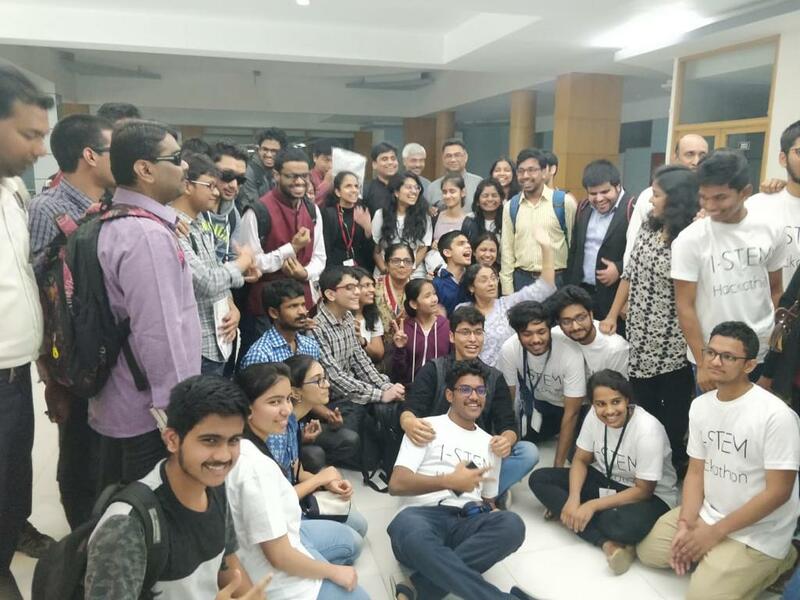 Organizers of the event included IIIT Bangalore, I-Stem, Vision-Aid, Vision Empower Trust and The Xavier’s Resource Centre for the Visually Challenged. The event was widey covered byl Indian media. Vision-Aid has been working with the Lui Braille Blind School in Agra, India on a range of projects. One of these projects is a spoken English program. The classes are taught in a blended model, with the primary instruction happening virtually with one hour long classes every day, and one local assistant teacher who helps to reinforce concepts. The progress we have seen from our students has been remarkable and inspiring! Computer Programming Classes for the Visually Impaired- Call for Volunteers! Vision-Aid is running an exciting initiative to teach computer programming to the visually impaired. The demand has been strong and we are actively recruiting teachers and mentors to help us. Do you want to get invovled? Please read on! Applications for Spring & Fall Semester 2019 Open. Vision-Aid held a workshop, in collaboration with it's partner, Youth4Jobs on Innovations in Mobile and Braille Technologies for the visually impaired in Bengaluru on 20th January 2019. The instructors Balaji, Justin and Manjunatha provided insights on various topics. Many trainers from Vision-Aid's partner organizations including Youth4Jobs, Samarthanam, Nethra, Aravind, Sankara Nethralaya and others attended the workshop. The knowledge and skills acquired by the participating trainers will ripple through to many others in coming months. Vision-Aid's partnership with Aravind Hostpital in Madurai is making great strides in proving support to the visually impaired in that part of the country. Video : Vision-Aid Workshop on “Navigation and Orientation of Accessible MOOCs for the VIsually impaired"